Obituary for Gwen (Olson) McCollum | Bowerman Funeral Home, Inc.
Gwen McCollum, age 93, of AuTrain, died Monday, April 1, 2019 at her family’s home in AuTrain, under the loving care of her family and Lake Superior Hospice. She was born on January 31, 1926 in Munising, MI to the late Harry and Hildur (Oas) Olson. Gwen graduated from Wm. G. Mather High School in the class of 1944. She began working at the Munising Paper Mill in the time office and mail delivery. While working there she met the love of her life Benjamin D. McCollum, and they were married on July 31, 1948. Gwen was a loving mother to not only her four children, but to many of the neighboring kids and Cub Scouts from Pack 332 where she was a leader for many years. In 1970, Gwen and Ben purchased and began operations at Northwoods Resort. Gwen worked hard for many years and eventually sold the resort to her daughter Pam. The sale did not stop her from continuing to work hard. Gwen continued to do laundry, help with rentals, make sure the docks were put in straight, and no one could paint pinecones better than Gwen when they made wreaths. Gwen was a talented poet and writer. She composed many beautiful poems about our local nature, seasons, and Yooper lifestyle, and wrote stories about her grandchildren. Some of Gwen’s favorite times were spent at camp on Mirror Lake: hunting for morels, cranberries, and blueberries, sitting around the campfire with family and friends, and searching for buried treasures on Treasure Island with her grandkids. In her later years, Gwen enjoyed wintering in Florida with her dear and special friend Don Hice, Sr.
She is survived by her children – Mike (Anita) McCollum of AuTrain, Jack (Sandy) McCollum of AuTrain, Pam Kuivanen of AuTrain, and Lisa (Packer) Dickenshied of Munising; grandchildren – Mike (Jodi) McCollum, Becky (Jason) Cain, Emily (Kerby) Albro, Ben McCollum, Erin (Jake) Miller, Amy Kuivanen, Chad (fiancé Christina Schwarz) Dickenshied, and Kaiti Dickenshied; great-grandchildren – Tom, Abby, Joe, Andy, Samantha, Lily, Linda, Isaiah, Kallie, Henry, and Ben; sister-in-law – Ann Olson; and goddaughter – Bev Micallef. Gwen was preceded in death by her parents – Harry and Hildur; husband – Ben; special friend – Don Hice, Sr.; son-in-law – Ed Kuivanen; siblings – Joyce (Ed) Hill, Charles (Edna) Olson, Harry Olson, and Tom (Marilyn) Olson; and special aunt – Beo Mitchell. 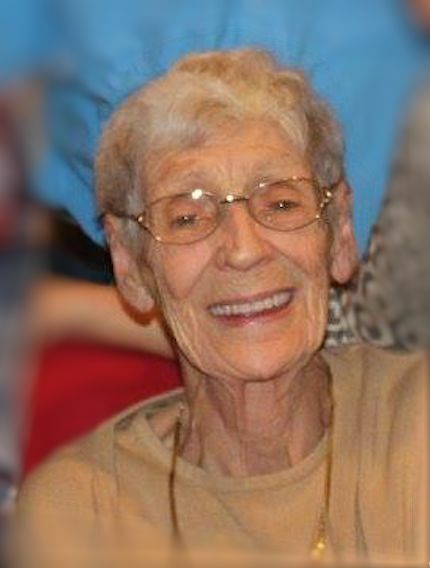 Visitation will be at Eden Lutheran Church in Munising on Friday, April 5, 2019 from 11:00 a.m. until 2:00 p.m. Pastor Ann Gonyea will conduct Gwen’s memorial service at 2:00 p.m. In lieu of flowers, memorials may be made in Gwen’s name to Lake Superior Life Care and Hospice, 914 W. Baraga Ave., Marquette, MI 49855 or Eden Evangelical Lutheran Church, P.O. Box 360, Munising, MI 49862.